Apologies in advance for the poor photo, but when you’re taking pictures in a restroom, you don’t always have all the time in the world. 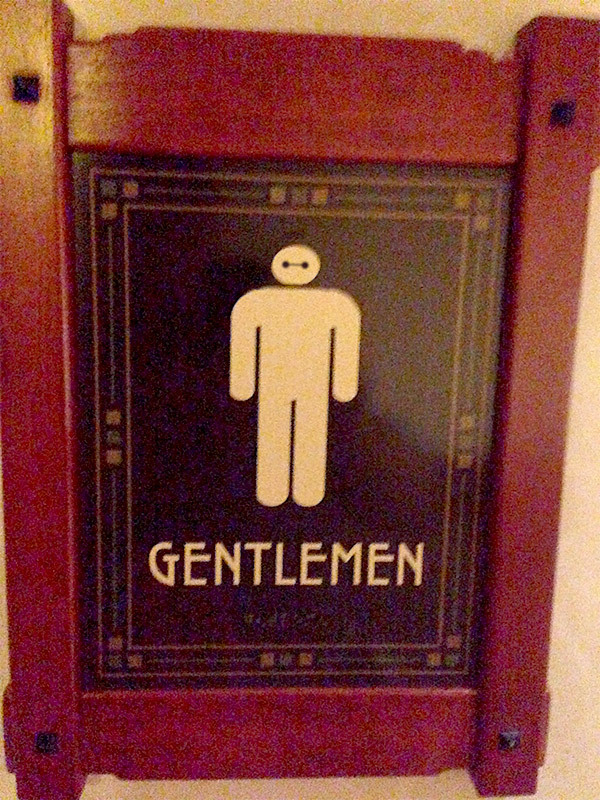 Anywho, we were mighty impressed with this subtle Big Hero 6 Baymax reference at the Grand Californian Hotel! Last night, the entire DisneyLies staff took the Disney’s Happiest Haunts Tour at Disneyland. The tour is a bit pricy at $600 (90% off with an annual pass or AAA discount), but it does include rides on many attractions and several treats over the course of its six hours, so the cost is justifiable (particularly if you are fabulously wealthy). We don’t want to spoil anything, but we thought we’d share a few highlights with you. The tour provides guests with both “tricks” and “treats.” There are four Halloween-style treats over the course of the tour, including a “fun size” candy pumpkin on a stick, a “ginger-psycho” man cookie, a candy apple with a gummy razor blade in it, and a commemorative pin (exclusive to the tour and containing an actual piece of ectoplasm). See what makes one of the hosts different from the other? That’s right — she never smiles for the camera! Hilarious! City Hall: Why do guests sometimes here echoes of ghostly gunshots in the distance? The Enchanted Tiki Room: What happened to Rosita? The Haunted Mansion: Why are the Doombuggies full of guests when they leave but empty when they return? Big Thunder Ranch: Why are we stopping here when it’s already closed for the evening? Mr. Toad’s Wild Ride: Why are we going on this instead of Snow White’s Scary Adventures? Chip ‘n’ Dale Treehouse: Why was it abandoned and left empty for all these years? Disneyland Monorail: Didn’t this used to stop at the Disneyland Hotel? Space Mountain Ghost Galaxy: What’s with the crabby space guy? Walt Disney’s apartment: Why can’t they turn off that lamp in the window, no matter how hard they try? The Haunted Mansion only has room for 1,000 haunts, but it has accommodated many more since 2010 when it went timeshare. Ray Bradbury’s Halloween Tree in Frontierland was named after the famous author Ray Tree. Some cast members swear that, late at night when the park is closed and empty, they sometimes catch sight of a ghostly Peoplemover car sailing through Tomorrowland. 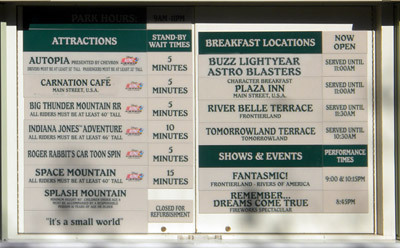 Near the end of Main Street is a handy display board on which Disneyland displays the wait times management has scheduled for selected popular attractions around the park. When attendance levels are high, wait times are increased to help pull guests out of busy walkways and into attractions, reducing park congestion. Note that this photo was taken during Disneyland’s experiment with a “Breakfast with Buzz” breakfast-bar buffet in the Buzz Lightyear Astro Blasters attraction. The event was canceled after just two days due to the mess, inconvenience, complaints about being rushed to finish eating before the end of the ride, indigestion, plate breakage, an unusually high toy-related lead content in the eggs, and poor tipping. All of the photos for the DisneyLies.com Disneyland Tour were taken on the same day for the sake of historical accuracy and the convenience of our readers. But little did we know when we took the photos that before the project’s projected end date (which will be reached when we come to the photo of Disneyland’s exit on March 12, 2046) Disneyland would go and change things, making some of our photos more nostalgic than informative. 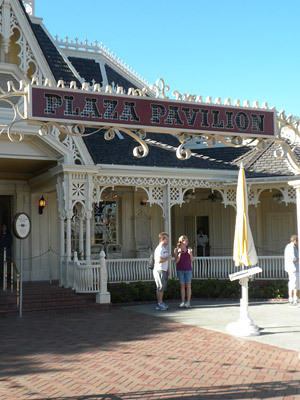 Such is the case with the Plaza Pavilion. 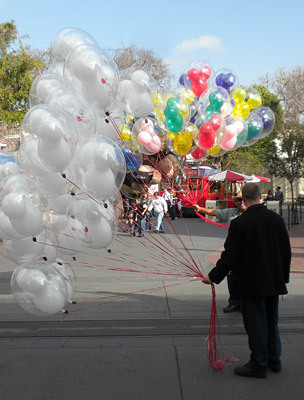 At the time this photo was taken, this location was used for the processing of Disneyland annual passes and the taking of photos for said passes, but today they not only don’t do that here, they no longer put photos on passes at all (due to new rules created as part of Disney’s pixel-conservation program). This former restaurant isn’t even a former restaurant anymore, as it has (if rumors are to be believed) been refurbished into some kind of eatery with a theme based on some Disney film or another. We don’t know what film it is, and frankly we don’t care because they’ve completely ruined the staccato flow of our Disneyland photo tour, and so far as we were concerned the Plaza Pavilion annual-pass processing center was practically perfect in every way. Making our failure complete, the last we checked the couple in the photo wasn’t standing outside the building anymore either. The inclusion of a “high-speed” piano player outside the Coca-Cola-sponsored Refreshment Corner is an excellent example of what Imagineers call “placemaking.” Speedy piano playing and high-sugar caffeinated beverages go together like uncontrollable twitching and adrenalin. Rod “Rod the Pianist” Miller played piano here every day without fail or vacation for some three decades. His inhumanly accelerated ivory tinkling was so hard on pianos that they had to be tuned every night and completely replaced every three days. The friction generated during a particularly intense performance of “Maple Leaf Rag” was enough that after the piece’s conclusion, you could actually fry an egg on the piano strings (an act which goes a long way toward explaining why the pianos had to be replaced so often). 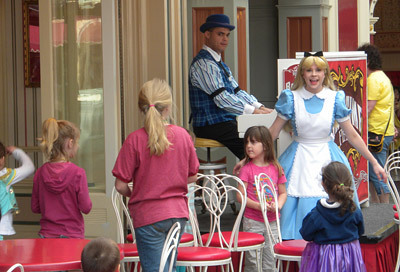 This location is also used for “The Mad Chair Party” — a daily game of Musical Chairs hosted by Alice in Wonderland (shown above doing her imitation of the Alice in Wonderland fashion doll). The game is great fun for kids, but is really just an excuse to get a bunch of guests to clean up the restaurant’s seating area without being paid. You will notice that the piano player is dressed in typical turn-of-the-twentieth-century pianist garb. 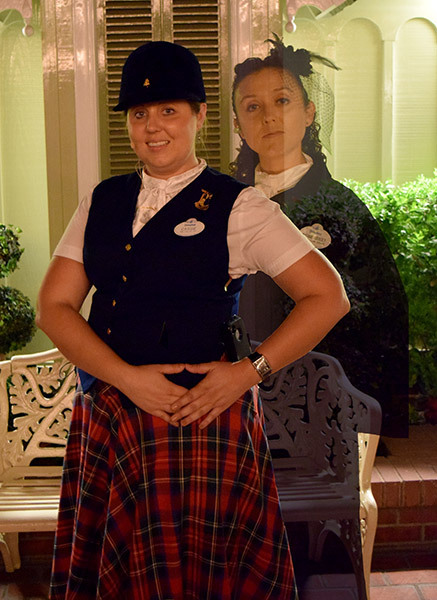 All Main Street cast members are required to dress and act as if they are people from another age. In fact, this is where the phrase “to act one’s age” comes from. In 1956, Coroner’s Corner (as the shop was whimsically if inaccurately named) obtained Coca-Cola as a sponsor. Guests who didn’t have the money for a fancy funeral or felt that they were a good distance from death’s door could drop 15 cents for a cold bottle of Coke from the ice-filled coffin at the back of the shop. Funeral-supply sales were slow on Main Street, but the soda business was booming, so in late 1956 Coroner’s Corner closed briefly, opening again in January of the next year as Coca-Cola Corner, a soda-themed hotdog eatery. 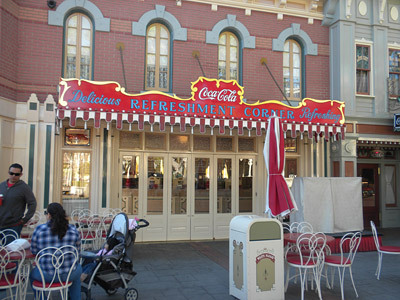 The name was later changed to Refreshment Corner, reflecting Disney’s fear of having to change signs should they ever lose Coca-Cola’s sponsorship. Cast members working at Refreshment Corner know that there is a secret room beneath the location that’s been permanently sealed, due to its been filled with disturbing and/or haunted funary leftovers. Attentive guests visiting Refreshment Corner will notice that Imagineers left a subtle reminder of the location’s former occupant in its decoration. If you spot it, leave a note in the comments! Within the Candy Palace can be found a variety of delights, such as salt-water taffy, fudge, chocolate, things covered in chocolate, fudge covered in things, and children covered in chocolate, fudge, and taffy. Goofy Candy Company products — famous for their wacky shapes, strange sizes, and/or unusual ingredients (e.g., hot pepper, bamboo sugar, and, before 1997, fiberglass) — can also often be found here. In the center of the Palace is the refrigerated case pictured above, from which can be purchased hand-dipped deep-fried Twinkies, chocolate-covered turkey legs, and cakes that appear to have been baked within cups. 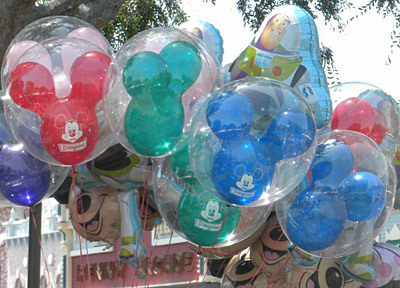 A variety of traditional treats is also available, such as jellied beans, jawbreakers large and strong enough to actually fulfill the promise of their name, and a lovely display of colorful giant suckers, many of which were present on Disneyland’s opening day in 1955. One final notable thing about the sweets in the Candy Palace is that none of the delightful treats made on premises have any calories (in Disney parlance, both dieting and obesity are “bad show”). It’s been a couple of days since our last post in the Disneyland Tour series, so we thought we’d get back into the game. We’ll try posting two or three of these a week and see if our readers are still interested in having their Disney knowledge expanded in this way. Besides, we spent a whole day taking hundreds of photos of the park and they’re hogging space on our hard drive so we need to move them onto the internet to make more room for our collection of “Release Song of the South” petitions and Brave fanfic. One of the most popular features of the Candy Palace is its large display window, through which chefs and chefettes can be seen hand-crafting various handsome confections by hand with their hands. 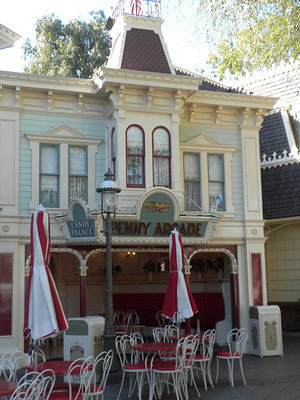 In the early days of the park, the cast members in this display area were not trained cooks but rather actors who had auditioned to play the part of candy makers (or “Mousekonfectionteers,” as Walt Disney called them). They were massively popular — entertaining guests with wacky pantomime and occasional pie- or molten-sugar-throwing antics — but had to be removed when the health department pointed out that their creations tended to be low on tastiness but high on insects, hair, and foreign objects. The Candy Palace is particularly busy during the holidays when the candymasters make large candy canes the old fashioned way, with cane sugar and actual peppered mints. Guests who want to purchase one of these fabulous creations must line up on Main Street on certain designated “cane crafting” days hours before the Palace’s opening, stand in the order dictated by their numbered wristband, take the “True Spirit of Christmas” pledge, and be prepared to fork over $20 for their allotment of a single cane. The high price has led to an inordinate number of candy-cane speculators who stand in line (or hire others to stand in line for them) in the hope of making a big profit by selling their candy cane on eBay for perhaps ten or twenty times its original price. When the candy cane tradition first started, the treats were not in such short supply. 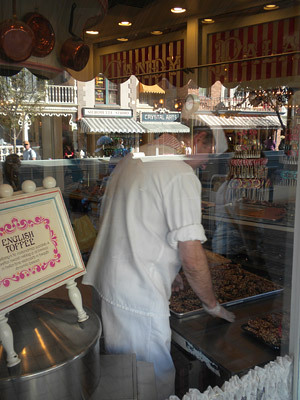 Instead, Disney hired extra chefs to work in the Candy Palace’s window to increase output. But as demand rose, the number of chefs increased to the point that the display window became known as something of a minty, Christmassy, sweatshop of claustrophobic delights, leading to a change in policy. Trivia: If you look carefully at this photo, you can plainly see that the Candy Palace’s window — like all windows on Main Street — is made from special glass that does not reverse reflections. It’s magical!